Speedy Ron Thorne came to UM in the Fall of 1993, after a stellar junior college career at San Jacinto CC in Pasadena, Texas. While at San Jacinto, Thorne excelled as an all-around track and field star. He earned JUCO All American honors in Indoor 500 meter, Outdoor 800 meter and the 4X4 relay, where he ran the anchor leg. 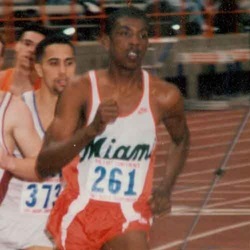 A native of Barbados, West Indies, Thorne looked to the University of Miami to complete his academic and athletic career close to home. He was thrilled to become a Hurricane and have a chance to live and study in Miami, home to a large West Indian community. Thorne made the most of his two-year UM Career. He earned two degrees, graduating with both a Bachelor of Science in Speech Communication and a Bachelor of Arts in Political Science in 1995. Thorne also became the first Hurricane to earn All-American honors for men's indoor track and field, doing so in the 800 meter event. Thorne was named the BIG EAST's most outstanding track and field performer in 1995.